Whales are without a doubt one of the most﻿﻿ mysterious and beautiful creatures in the ocean, with many people traveling hundreds of miles in the hope of spotting one of these gentle creatures. Thankfully there are ﻿﻿﻿100′s of Whales to be viewed at Hermanus,﻿﻿﻿ South Africa, very close to land ﻿﻿﻿during the months of early June to late November﻿﻿﻿﻿﻿﻿. 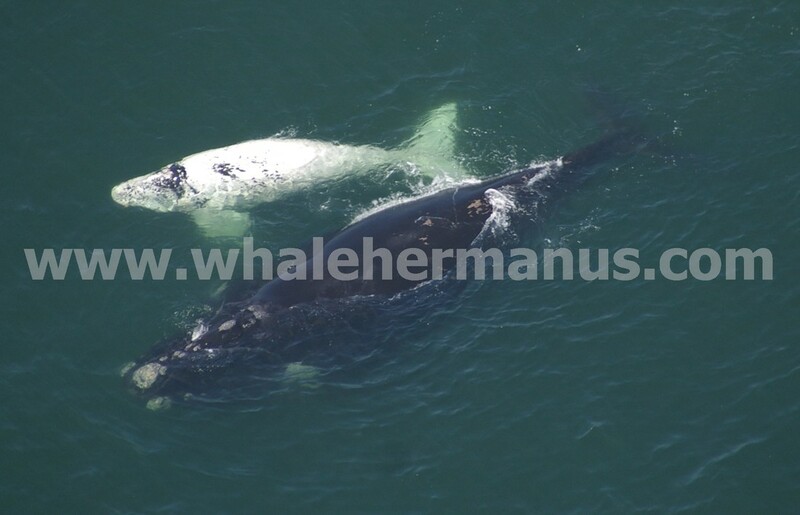 ﻿﻿﻿With the largest number ever spotted, by Cessna light plane aerial survey, in ONE day being 196 Whales in our small Walker Bay at Hermanus, South Africa. Hermanus is situated on the stunning South Coast of the Western Cape (90mins from Cape Town) and is famous for its incredible viewings of Southern Right Whales. Hermanus should in fact be considered the official home of the Southern Right Whale, since every year during late Sept/early Oct, Hermanus hosts it’s annual Whale Festival, which attracts over 150,000 people and when the Southern Right Whales arrive in large numbers to breed, give birth and playfully frolic in the sea – This year the Whale Festival will be held from - 27th to 29th Sept, 2019. (Other species of Whales that can be viewed are﻿ ﻿Humpbacks and Bryde’s Whales, as well as, African Penguins, Cape Fur Seals and if you are very lucky pods of Dolphin). 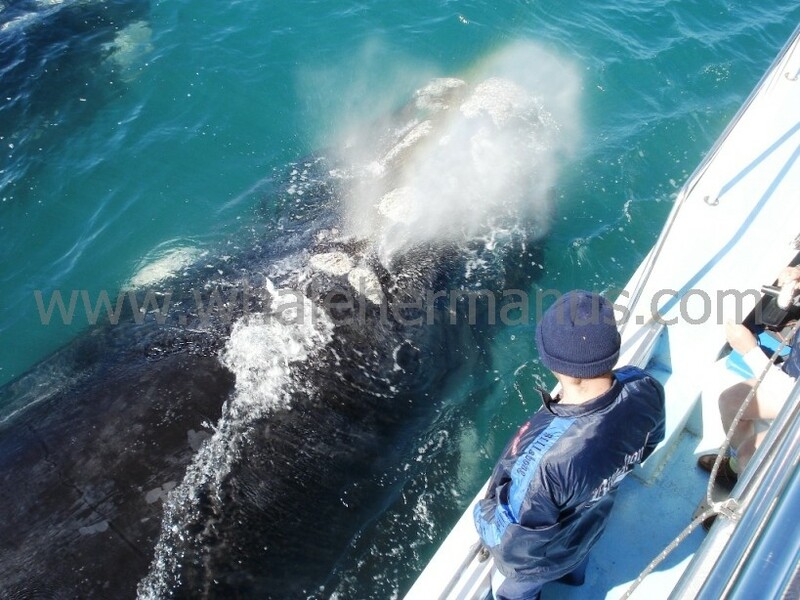 ﻿﻿﻿﻿Whale watching boat trips﻿﻿﻿ at Hermanus will take you out to sea to get even closer to these incredible creatures. The Whale Festival of Hermanus is unique in that it celebrates the arrival of the Southern Right Whales – with all manner of Arts & Crafts markets, large stages for music bands and DJs, kiddies arena, Eco-marquees showcasing the diverse marine creatures, all sorts of cuisine and food stalls, drama, theatre groups and stage show performances, as well as being classified as the only Eco-Arts Festival in South Africa. 27th to 29th Sept, 2019. Hermanus in South Africa is considered to be the world’s premier site for watching whales and the many people who flock there during the Whale season of June to late November, look forward to catching sight of these intelligent creatures playing in the water. The whales in Hermanus do indeed play…..they are known to manoeuvre their flukes (tails) to catch the prevailing wind and “sail” along in the water…..just for the fun of it! They also love jumping clean out of the water (called breaching), to crash back down into the sea with an almighty splash. Fantastic to see!! Hermanus boasts its own “Whale Crier” (the only one in the world) who is employed to wander the cliff paths and call out the locations of the whales throughout the day to everyone walking by. Please take lots of photos of you with him. There are some fabulous places to visit in and around Hermanus; it’s noted “Blue Flag” beach is Grotto Beach which is the biggest beach in Hermanus. Voelklip and Kammabaai beaches are also notable places to visit. Fernkloof Flower gardens; the Hemel-en-Aarde Wine Valley is now world famous for over 120 award winning wines - Pinot Noir, Chardonnay, Sauv Blanc and many other wine cultivars. Fantastic scenic views from mountain tops and gorgeously pretty countryside. Hermanus has many excellent restaurants, funky bars and many pleasant shops, boutiques and art galleries. 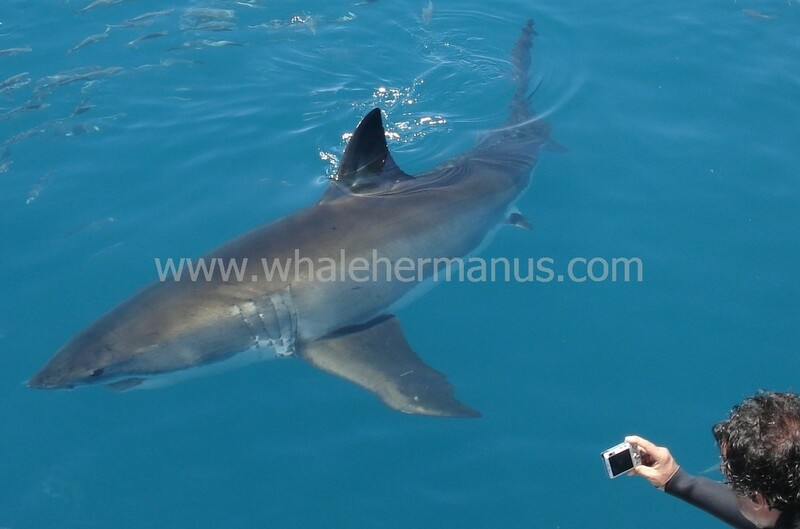 Great White Shark & Copper Shark cage diving – if Prince Harry and Brad Pitt can do it – so can YOU! 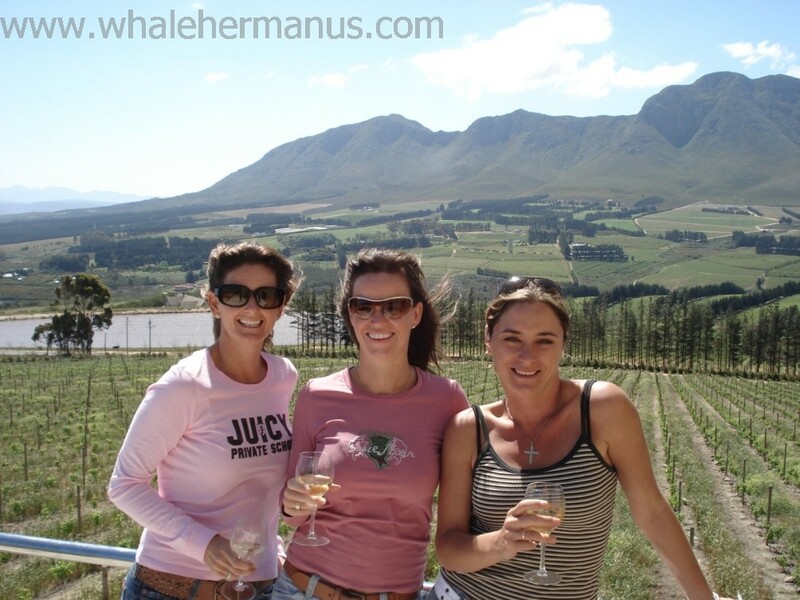 Wine Tours – of our Wine Valley – Hemel-en-Aarde – with 21 excellent wineries, 14 great tasting rooms, 6 fab restaurants and over 120 award winning wines – wine tours can also be arranged to visit further afield locations - Stellenbosch, Franschhoek, Paarl, Elim, Constantia and all points in-between….. Hiking – to discover loads of beautiful scenery, mountains, plants and much more…. Amazing Races, Team Building, Corporate events, Stag days – exciting day events custom-built for all sorts of groups. And don’t forget to totally enjoy and indulge in our culinary wonders at over 70 mouth-watering restaurants; while our excellent 200 accommodation establishments offer fabulous and very comfy beds and massively filling breakfasts…..
Whale watching, Boat Trips and many Adventures in Hermanus, South Africa.